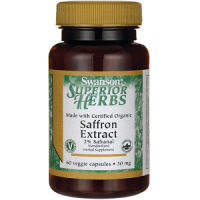 Today we have compiled this review of Swanson Saffron Extract. These vegetarian capsules contain only organic saffron and are shown to help improve your mood and overall happiness. This supplement helps promote a healthier, more stable mood. What’s in Swanson Saffron Extract? This supplement’s main ingredient is Certified Organic Saffron Extract (Crocus sativus). Each capsule contains 30 milligrams of the extract. According to the studies done on the effectiveness of saffron for mood support, 30 mg is the recommended maximum daily dose of saffron. 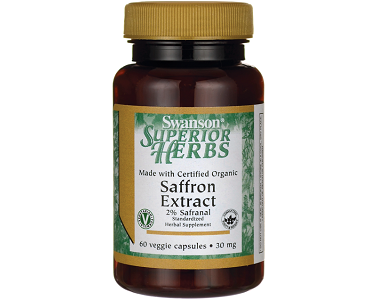 How Do You Use Swanson Saffron Extract? The manufacturer recommends taking two capsules daily, one in the morning, and one in the evening, both before a meal. 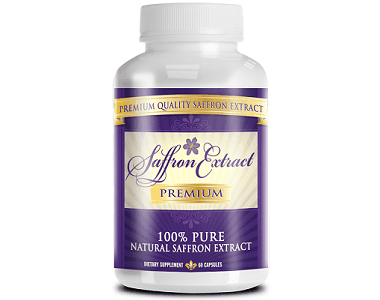 This dose worries us because studies have shown that 30 mg is the maximum recommended dosage of saffron extract, and by taking two capsules of this supplement, you will be doubling the daily recommended intake. The studies we found in our research said that even doubling the 30 mg recommendation can potentially cause harm to the body. The manufacturer’s suggested retail price is $22.99, but if you buy directly on their website, this supplement only costs $16.69. You can save an extra 10% and receive free shipping on orders over $50 with their coupon code. Also, if you enroll in automatic shipments, you will receive 10% off of your next order as well. Also, by inviting friends to make purchases through the manufacturer, you can receive $10 off of your purchase. Unfortunately, the manufacturer does not list any kind of money back guarantee. They do, however, have a return policy listed on their website. If unsatisfied with the product, you can return any unused portion within 30 days for a full refund. We feel this is not a long enough return policy to give this product a full chance to see how it works. Most supplements need a few weeks to be able to build up in your system before seeing results, and with a 30-day return policy, it makes it difficult to know whether or not the supplement will actually work. There are a few things we liked about Swanson Saffron Extract. First off, we do like that the capsules are made with 100% vegetarian-friendly materials and that the saffron extract is certified organic. Also, the amount of saffron in each individual capsule is the recommended daily dose by the studies we researched. Unfortunately, there are also many things we did not like about Swanson Saffron Extract. To start, the manufacturer suggests taking two capsules a day for maximum effect, but according to the studies we found, that would double the recommended dose. These studies state that doubling their recommendation could even cause more harm than good. Also, the manufacturer does not offer any kind of guarantee on its products. If a manufacturer cannot offer a guarantee, it shows they may not be as confident in their product. While they do offer a return policy, returns must be completed within 30 days, which does not give a long enough time period to try the supplement. Overall, we cannot recommend this product for mood support.